So here we have a whole new spate of new images from The Hobbit app that Warner Bros released. Now I wish they would do this for android phones as well – I am not even going to ask for something for my Blackberry because I know that is not going to happen. But who knows? We are after all, talking about a realm where dragons fly. 🙂 But apart from my meagre cribbing, let me get down directly to sharing the goodies that I gathered. 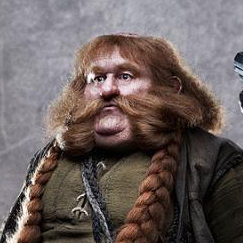 An interview with kiwi actor Stephen Hunter ‘Bombur’ about getting cast for the Hobbit. Dwarf of Thorin & Company. Bombur was descended from the Dwarves of Khazad-dum but was not of Durin’s line. His brother was Bofur and his cousin was Bifur. Bombur was one of the thirteen Dwarves led by Thorin Oakenshield on the quest to the Lonely Mountain to regain their home and treasure from Smaug the Dragon in 2941 of the Third Age. Bombur’s hood was pale green. His instrument was the drum. Bombur was exceptionally fat. His size occasionally caused problems on the quest. When he arrived at Bag End, Bilbo Baggins opened the door so suddenly that Bombur fell on top of Thorin. Bombur had difficulty running from the Orcs in the Misty Mountains, especially when he had to carry Bilbo part of the way. When Gandalf asked the Dwarves to come to Beorn’s house in twos, he said that Bombur would count for two and should come last, but Bombur refused and joined the last pair. Bombur was also picked to go last when the company prepared to cross the Enchanted Stream, but then a deer appeared suddenly and startled Bombur so that he fell into the stream and fell asleep. The Dwarves were forced to carry him through Mirkwood for several days. He finally woke up and disturbed his hungry companions by telling them about the wonderful food he had dreamed about. When the Dwarves were captured by the Great Spiders, fat Bombur was their first choice to eat. Bilbo drove the Spiders away from Bombur with rocks and then used Sting to kill many of them. At the Lonely Mountain, Bombur would not climb up to the secret door and stayed behind with the ponies until Smaug came roaring out of the mountain. Then Bombur was pulled up by a rope and hid in the passage with the others. When Bilbo decided to sneak away from the Lonely Mountain and make a deal with the Wood-Elves and the Lake-Men, Bombur was on guard duty but he happily agreed to let Bilbo take his place so he could sleep. Bombur survived the Battle of the Five Armies and remained at the Lonely Mountain. When Gloin met Frodo Baggins at Rivendell in 3018, he reported that Bombur had become so fat that he could not walk and had to be carried to the table by six stout Dwarves.